Adorable, quaint, private, lovely Clemons Cottage is located at 406 Budleigh Street, Manteo NC , on very desirable Roanoke Island, OBX. You will enjoy the private garden surrounded by the quintessential white picket fence with arbor, roses, hydrangeas, perennials, and colorful furnishings. If you peek you may glimpse the hidden fairy garden. Inside you will find 2 bedrooms with comfy beds and lovely linens. A complete kitchen makes Clemons Cottage a perfect option for guests who would like to enjoy preparing some meals while on vacation. Even though the cottage is one of the historic properties in Manteo, you will enjoy modern conveniences like HDTV and wireless internet. Comfortable air conditioning in summer and heating in winter makes Clemons Cottage a year round destination. walkable to the quaint old town Manteo waterfront. CENTRAL Air Conditioning and Heat, Umbrellas, Library of VCR movie tapes and books, CD player/radio, microwave, refrigerator, micorwave, beach towels, beach chairs, peace and privacy and relaxation! Escape from Maine “mud season” ! Everything was perfect from the cute cottage, the quaint town of Manteo, the attractions, the weather, the food and the friendly people. We were delighted by the dog friendly culture of the area. We especially want to thank Sharon, or VRBO host, for her responsiveness, friendliness and attention to detail. Clean, comfortable beds and nice linens. Internet, TV, etc. all perfect. Location great. Love this little cottage. 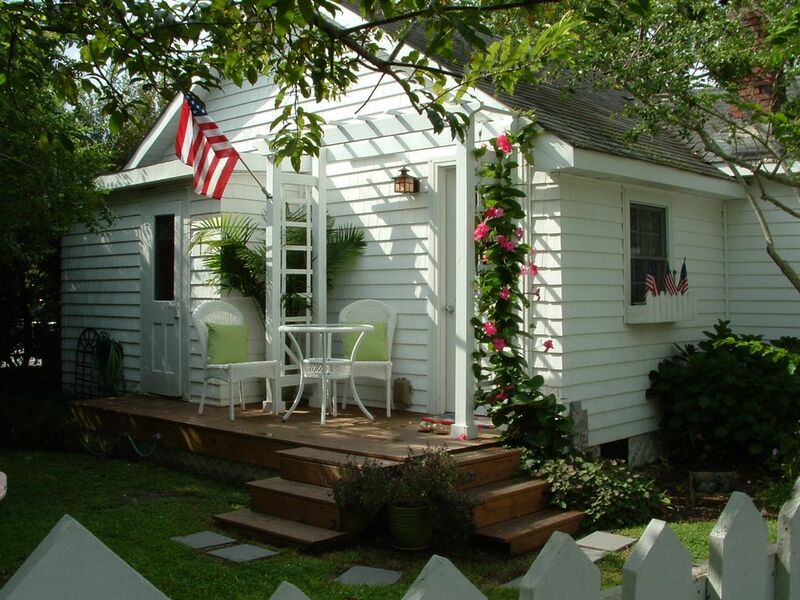 Clemmons Cottage is a cozy cottage just a short walk from the water in beautiful Manteo. Only a block or two away along quiet town streets are restaurants and shopping. The beach is just a short drive. Daily walks in Festival Park, good food and the beautiful cottage made a month long stay a delight. Sharon is delightful to work with. You'll enjoy personalized attention in a quaint, clean, a well appointed Roanoke Island home. This is our favorite place to stay in Manteo. The garden is magical and the cottage is whimsical and very comfortable. It all combines for a wonderful escape. It is the perfect location for walking around town. We will return. Oh, so lovely! Two blocks from the water, surrounded by streets bearing the names of the first English to settle the area, as well as the Native Americans who both welcomed and came to mistrust them. Amazing to be among those ghosts, as well as nearby more recent heros--the Wright Brothers. Every day a wonderful adventure bookended by relaxing in such a lovely home. Every convenience, most especially the central air, the Adirondack chairs in colorful colors, the super comfortable beds...a lot of charming decor in a quaint compact space in a quiet neighborhood filled with beautiful homes. Loved every day of our week there. Thank you, Sharon! Very nice cottage for a short stay in Manteo. Everything needed was provided, it was clean, and it was very pretty all around. We had parking all to ourselves, and we were within walking distance to the shops and restaurants in town. walkable to historic Manteo waterfront ~ just blocks to restaruants, wedding venues, bookstores, coffee shops, eclectic shops, waterfront activities including sailing, kayaking, parasailing, fishing and star gazing.